Crude oil prices are on the bid amid intensifying political tensions in Venezuela and despite a weekly surge in weekly Crude stockpiles data. The black gold price climbed towards the $53.91 level despite the Energy Information Administration reporting earlier in the day that domestic crude supplies climbed by 8 million barrels for the week ended January 18. However, bulls are back in control as investors look to the bullish developments for oil in Venezuela considering that the country holds the rotating presidency of OPEC this year and whether sanctions will be put forward. The Trump administration has put together a set of restrictions on Venezuelan crude exports but still has not decided whether to deploy them, and that is bringing uncertainty and huge support for Crude prices. 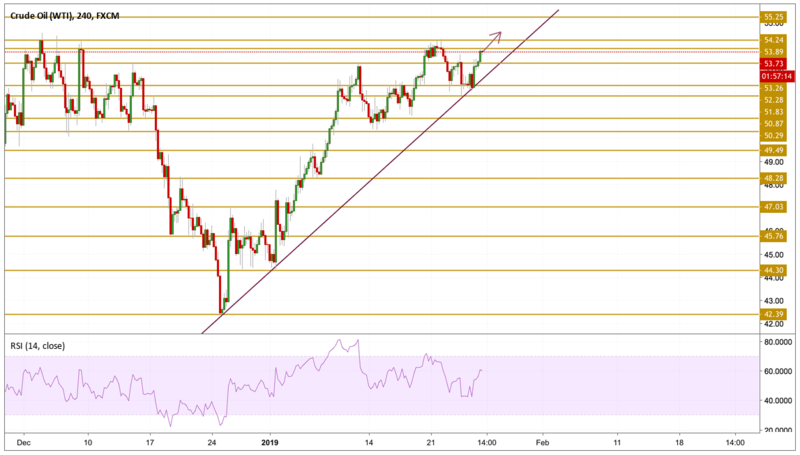 After a big battle between the bears and the 52.28 support level, the bulls are back in control after the price bounced off from this level and surged towards the $53.89 resistance after getting support from the purple trend line presented on the chart. The prices now are hovering just below the recent tops and look to break above them with a bullish momentum. The next level we will be focusing on is the 55.25 level but before we would like to see a consolidation above the $54.24 level.